I've been known to randomly poke around Amazon in search of unknown beauty products that could potentially change my life. This morning, I stumbled on a wonderful little gem and I couldn't be any happier. The actual product itself is manufactured by a well known Japanese beauty brand. In fact, they are the makers of one of the most popular cult facial cleansing oils on the market. It just so happened that they also carry a line of "after shower hair products." These items are specifically made for application post shower. We already know the value of adding product to damp skin post shower. Applying an oil/lotion to wet skin enhances our skin's moisture retention levels in a wonderful way. Why not apply this same principle to our hair routine? Thanks to the inspiration I received from DHC, I may have found a way to replicate the perfect DIY after shower hair oil recipe. The after shower hair treatment is a simple oil based product applied to wet hair to retain moisture, prevent frizz and add shine. The timing of the application is what matters most. While the hair is wet, the cuticle layers are slightly lifted to absorb the water particles. This can be a dangerous time for our hair because lifted cuticles are more susceptible to damage and breakage. But, on the other hand, we can leverage that situation for our benefit. 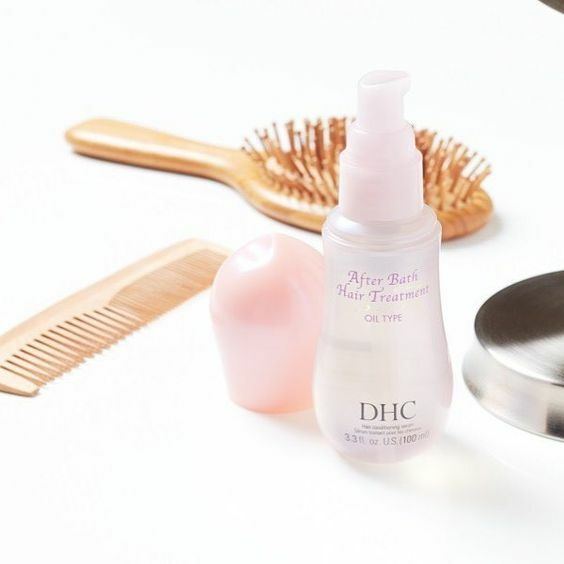 The folks who reviewed DHC's After Shower Hair Oil Treatment claimed to experience softer, shinier, smoother hair post use. Another wonderful benefit that I'm super-excited about is how this product also manages frizz. In mid-July, frizzy hair is our greatest enemy. If this product can free us of this burden, I'm here for it! Just before I made the purchase, I took a quick look at the ingredient list. At first glance, I noticed that the primary ingredients were silicones. That's understandable since most frizz elimination products utilize silicones to block moisture and humidity from disrupting the strands. Some people tend to avoid 'cones because they coat the cuticles promoting product buildup. As I continued to survey the ingredient list, I noticed the after bath oil also contained squalane, olive oil, shea butter and vitamin E. That's when I realized that I could create a quick DIY version. For my first experiment, I kept it simple by mixing a little squalane and baobab oil. Squalane has a similar consistency and feel as silicone hair serums but it's all natural. Baobab is my favorite oil at the moment so I figured that pairing them together would be a winning combination. First I misted my hair with soft water mixed with a little leave-in. Once damp, I ran a little of my blended hair oil into the strands. Immediately, I noticed the difference. My hair was smooth, shiny and moisturized. I've instantly fallen in love with this hair oil concoction. Although I'm not sure it will repel humidity, long term, as well as a product with silicones, I feel like this combo gives a similar initial result and I'm very happy about that. Next up, I try this on wash day after applying leave-in. I might still pick up DHC's formula for those times when I need that extra bit of humidity fighting power. Also, silicones have heat protectant qualities which makes it a great product to use prior to blow drying/flat ironing. But, until then, this DIY version is absolutely perfect.